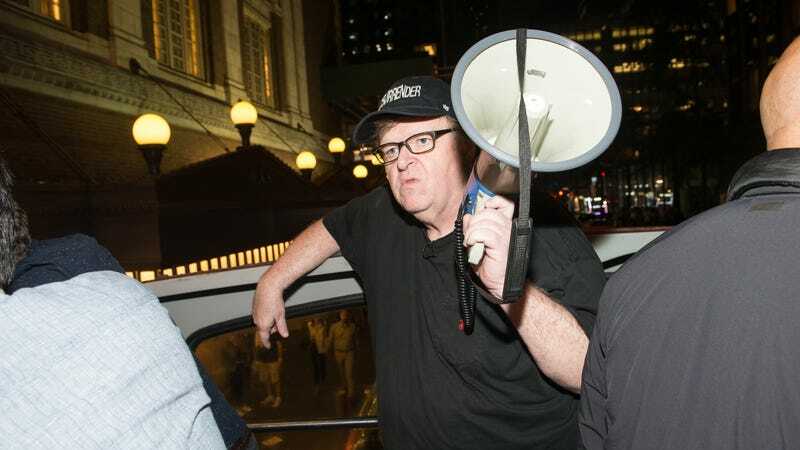 Michael Moore’s Broadway show The Terms Of My Surrender closed without achieving its goal of taking down Donald Trump, but Moore can’t be stopped that easily. According to Deadline, he’ll soon be taking The Terms Of My Surrender on tour, saying in a statement that “there is no surrender” and that he’ll be hitting the road next summer. Considering how tumultuous the political environment is in this country, though, Moore might have to completely change his show by next summer. For all we know, some other jackass will be the president by then, or maybe King Trump will have outlawed all traveling Broadway shows that are built around criticizing him. The Terms Of My Surrender ran for 100 shows on Broadway, with Moore saying in his statement that it was “the most fulfilling experience” of his career.” As Deadline notes, he was frequently joined by special guests, including Bryan Cranston, Gloria Steinem, Maxine Waters, and Stephen Colbert. He and Mark Ruffalo also took the audience to Trump Tower for a protest one night, though it would be tough to replicate that stunt in most other U.S. cities.